And Old West lawman revisits the site of a traumatic incident from his youth and recalls his part in the death of a colleague. Andrew Coats and Lou Hamou-Lhadj’s all-but-wordless film has a few moments of spectacular action (a high-speed stagecoach wreck) but mostly it is a quiet, evocative meditation on grief, told through spectacular three-dimensional computer animation. Remember the opening sequence of Pixar’s “Up” depicting the romance and marriage of the main character? Patrick Osborne’s “Pearl” does something like that to depict the title character’s coming of age. Pearl is a little girl traveling the country with her hippie/troubadour father, living out of a car. We see snatches from her childhood. Her father gives up his guitar dreams and settles down. There are father-daughter fights. Eventually a teenaged Pearl breaks away and launches her own rock band. In a sense her father’s dream has come full circle. Again, with almost no spoken dialogue, “Pearl” is a sweet and sad yarn of generational aspiration told in a wildly original visual style. This Disney/Pixar effort — it played in theaters last summer with “Finding Dory — is a wordless (naturally) story of a young sandpiper learning to fend for itself along a seashore. In many regards it it classic Disney, a tale of an impossibly fuzzy young animal learning survival techniques through often comedic trial and error. The film’s depiction of out hero’s environment — sand, waves, sky — is astonishing realistic. “Piper” often teeters on the edge of terminal cuteness, but the brilliant animation keeps it on track. Theodore Ushev’s “Blind Vaysha” is a Slavic folk tale about a girl with an unusual condition. Her left eye shows her the past while her right eye displays the future. Because she cannot see the here and now, Vaysha is for practical purposes blind. She finds herself wondering which is better…living in the comfort of the past or the dangers of the future. 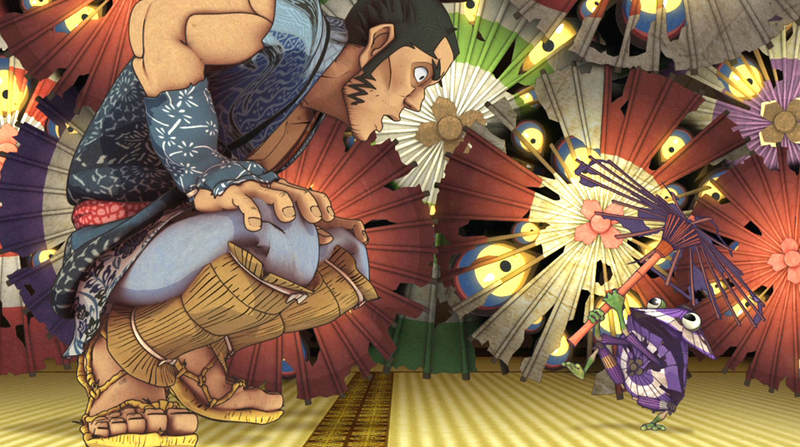 Here’s what makes “Vaysha” special: The entire film has been rendered in what appear to be animated woodblock prints. The effect is haunting. Robert Valley’s animated first-person memoir about the life and death of an old friend is filled with so much specific detail that it must have been based on a real-life relationship. The deadpan narrator describes his high school buddy Techno, a superb athlete and risk-taking daredevil who descends into debilitating alcoholism. Cures, relapses, a stint in a Japanese hospital for a liver transplant…Techno’s downward spiral is depicted through artwork that looks like it was pulled from an innovative graphic novel. Much of the film is in black and white, but splashes of color highlight important moments. “Pear Brandy…” is about the links that hold old friends together even when common sense tells us it’s time to break away. “The Head Vanishes” (9 minutes), about a woman with dementia who is determined to make her annual train trip to the seaside. “Asteria” (5 minutes), follows two astronauts who make an unexpected discovery on a barren planet. is about the links that hold old friends together even when common sense tells us it’s time to break away. This year’s program of Oscar-nominated animated shorts opens Jan. 31 at the Tivoli. In this visual tour-de-force – presented in a cell-animation form that often resembles classic Japanese prints – a traveler seeks shelter from a storm in an abandoned hut deep in the woods. But thought it’s tiny on the outside, this building seems huge on the inside. The man discovers hundreds of torn and broken parasols which he painstakingly repairs. Little by little he explores this haunted environment, and has an encounter with the ghostly woman who lives there. Clearly inspired by samurai movies (especially “Ugetsu”), Shuhei Morita’s film defies waking logic – it’s a dream (or a nightmare) adhering to its own rules. But – good lord! – is it ever beautiful, a masterpiece of design, an opera of light and shadow, a seamless synthesis of classic Disney-style animation and Japanese anime. I could watch it again…and again… and again. Taking her cue from Buster Keaton’s silent masterpiece “Sherlock Junior” (a dimension-bending comedy in which a movie projectionist dreams that he enters the world depicted on the screen), Disney animator Lauren MacMullan has come up with a witty – even metaphysical – idea. Her short begins with an old (or is it?) 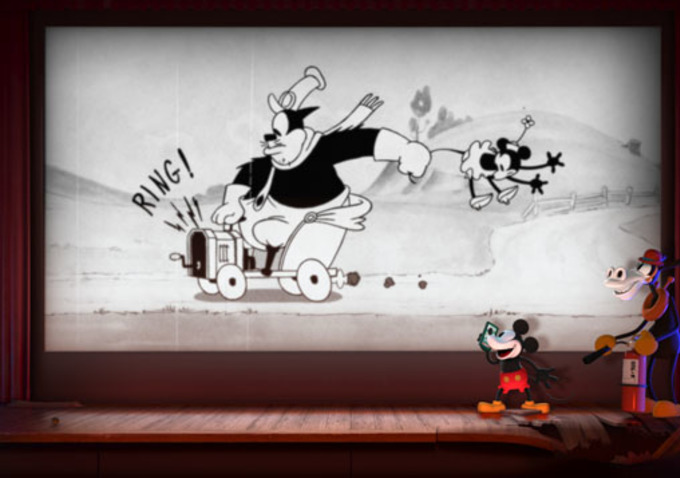 black-and-white Mickey Mouse cartoon and then breaks down the barriers between screen and theater auditorium. In the “old” movie, Minnie Mouse is kidnapped by perennial villain Pegleg Pete. Mickey tries to save her. But at a certain point the action spills off of the screen and into the theater in which we are sitting. Once they are in our reality, the characters are presented in full color and the rounded surfaces of sophisticated computer animation. Audiences for Disney’s Christmas release “Frozen” saw “Get a Horse” in 3-D, which further highlighted the difference between the flat “old” movie and the depth of the action unfolding in front of the screen in the “real” theater. This is less an animated comedy than it is a meditation on real and unreal, 2-D and 3-D, on animation’s roots and its current state of anything-is-possible.